Whether you are new to massage or a professional massage therapist, Brandon Raynor’s Massage Courses will train you to be one of the most effective and powerful massage therapists in your area. We offer unique, intensive short massage courses that will equip you with the knowledge, skills and confidence to perform healing and transformative massages for your clients in as little as two weeks.This 5 day Raynor Massage Certificate course allows students to quickly develop their skills and begin to massage effectively, assisting their client’s healing journeys. Drawing on over twenty three years experience and study of worldwide massage traditions, Brandon Raynor developed Raynor Massage as a unique style of massage designed to find and eliminate residual tension in the body. You will quickly begin to learn and practice Raynor Massage, always keeping in mind the overall goal of the total release of residual tension in the muscles of the body. Raynor Massage draws on holistic understandings of the interconnectedness of body, mind and soul and as well as working on muscular tension. Raynor Massage also opens up the channels or meridians through which the chi or prana (life force) flows. People leave this massage with a relaxed body and mind, feeling re-balanced. On our short and intensive training course, you will learn how to massage using this holistic and very powerful technique. In this video Brandon Raynor talks more about the Raynor Massage Courses. Being taught in a group of no more than 16 students to one teacher, this five day intensive massage course is an excellent way to get started with Raynor Massage Therapy. This unique form of massage is taught in a unique way, along with the expert tutor input and observing your teacher at work, you will be massaged and be massaging from day one of the course. You will work with partners of different body types and presented with different ‘problem areas’ so that you are equipped to deal with a range of clients on completion of your course. We do not teach by asking you to rote learn charts and diagrams, rather we teach you to feel tension, to track where it is held in the body and then how to clear it. This is the way massage has been taught for millennia before it was ‘medicalised’ by those who do not believe in the power of healing touch and intuition. Your teacher will be on hand to offer advice and guidance, to demonstrate, correct and empower you to be able to develop your own massage skills. Our bodies hold tension in muscles for all kinds of reasons; everyday stress, sports training, injuries, bad postural habits, hours spent hunched over the keyboard, problems experienced at work or home, all of these things are held in our muscles and lead to problems of residual tension and pain. Untreated this tension can lead to longer term problems both physically and in our mental and emotional wellbeing, as a trained Raynor Massage practitioner you can have a positive effect on people’s health, help many to be pain free and learn to release your clients from this muscular tension and any emotional tension that may underpin it. 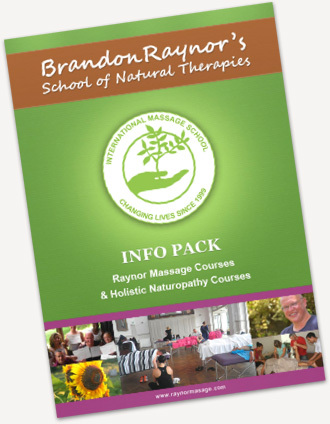 Raynor Massage training is only available through the Brandon Raynor School of Natural Therapies and is run in locations throughout the world. All of our teachers have trained under Brandon Raynor and continue to develop their own skills as teachers and practitioners by their ongoing work with Brandon, each bring their own experience and backgrounds to their classes and all are existing practitioners, dealing with clients on a regular basis. You cannot get this training at your local college, you cannot do it online – this is hands on training taught by people who have developed their art and whose role is to pass it on to you and help you develop your massage. All teachers are appointed directly by Brandon Raynor to ensure that the quality of teaching and training is of the highest standard. The five days are very intensive and usually run from 9-5pm with a 45 to 1 hour break for lunch. The teacher is available at all times to guide, coach and answer questions. I must say I had a fab time learning about RAYNOR Massage on my Dublin course. Michael is a fab Tutor. Very Patient and had much time for his trainees. I would definitely recommend the course. I couldn’t believe how much I learned in a week. And everyone now enjoying my massage. Students come to our courses from a variety of backgrounds. Some will have a background in another massage modality whilst others, perhaps the majority, will come with no experience, this course will be their first attempt at massage. Raynor Massage has at its heart the belief that every person you massage will be different and have different needs, therefore there can be no one set massage routine that will work for everyone. People taking the course who have massage experience will have the advantage that they have hands on experience and are already confident working with people’s bodies and equally those without any experience have the advantage that they do not have to unlearn any techniques as they begin to work with the unique form of Raynor Massage. Our teachers work with you from wherever you start – whether this is your first massage or you have been in the industry for years, by the end of the week we expect you to be able to give an effective Raynor Treatment and will support you in that developmental process. What Does The 5 Day Massage Week Comprise? The history of massage and an outline of the different types of massage. What the contraindications to massage are – when is it safe to massage and when you shouldn’t massage. How to take a case history from clients. Important hygiene issues when massaging. How to professionally drape your client to make them feel safe, warm and comfortable. The professional ethics expected by a Raynor Massage therapist will be outlined and we will explore the qualities of a good massage therapist. This will be followed by a demonstration of massage techniques by the teacher on a volunteer from the class and we will begin to explore strategies to loosen up tension and blocked energy in the back, the back of the legs, buttocks, feet, arms and hands. You will also be shown the bands “of tension” that interconnected the whole body. In the afternoon, students pair up and begin working on each other, under the close supervision of our teacher, half way through the afternoon you will swap over so that each person in the pair both give and receive massage. On day 2 of the Certificate course, the teacher will cover a side position that we use to release deep seated tension in the sacral area, which when released can help loosen up higher areas in the back, neck and cranial (head) areas. A good massage therapist will learn as much from receiving a massage as they will from giving one, which is why we put emphasis on you receiving massage as well as giving. You will learn how working to different depths feels and you will experience the powerful release of tension that your future clients will experience. As you work, revision of the previous days work will also be covered and your teacher will also discuss on the concept of the release of toxins in the body and the natural therapies term “the healing crisis” and what it means to you as you practice Raynor Massage. On day 3 the massage teacher will cover the release of tension in the front of the body, especially the abdominal area and the head. Many people store emotional tension in their bellies as revealed by common expressions such as “it gave me knots in my stomach” or “I felt that in my guts”. Conditions such as Irritable Bowel Syndrome, ulcers, Chronic Fatigue Syndrome, menstrual problems etc. can be helped by Brandon’s techniques of releasing emotional tension stored in the abdominal area, combined with proper breathing techniques. The teacher will again demonstrate on a (different) volunteer from the group how to massage to get this front of body tension release and in the afternoon you will pair up with a different person from the group to give and to experience this part of the massage. By this stage in the course you will be growing in confidence and will be impressed by how effective you can already massage. Day 4 of the course is spent combining the techniques performed in the last 3 days to perform a complete massage and is spent examining how the tension in the muscles on the front of the body can hold the muscles on the back of the body tight. We will also explore massage in pregnancy, many massage schools regard pregnancy as a contra-indication to massage, but at Brandon Raynor’s School of Natural Therapies you will learn how massage in pregnancy is natural, has been the part of the anti-natal care of mothers for millennia and can be highly effective. You will be taught how to do this safely. We will also examine the tools of the trade looking at different types of base oils used in massage and the properties of a good massage table. On the afternoon of day 5, the teacher will conduct a practical assessment to make sure that students understand the concepts taught, this will involve assessing your practical massage skills, maybe even giving the tutor a massage so that your massage can be experienced by them! At the end of this day, provided that you have understood and can demonstrate the techniques and satisfy the professional conduct requirements of BRSMNT, then you will qualify at the introductory level with a Raynor Massage Certificate. The Certificate level is enough to allow you to get started and begin to practice massage professionally in much of the world including most of Europe, Australia, New Zealand, some parts of the United States and Canada, most of Asia and Africa. Most students completing the Raynor Massage Certificate course decide to progress onto the Raynor Massage Diploma Course so that they can further develop their skills and add treatments such as aromatherapy into their practice. Some people choose to do this straight away and our Diploma courses almost always run the week following the Certificate courses, others choose to gain more experience first and then return to do the Raynor Massage Diploma Course. Students can also study the two courses in different countries enabling them to combine training with holidays and travel. We frequently have students who sign up initially for the Certificate week but then, having experienced this massage for themselves, want to continue straight on to the next level, often before then going on to study for our highest level qualification, the Advanced Practitioners Diploma. Discounts are also available if you book for more than one course at the same time. Many thanks to BRSNT especially to Michael McElroy I’ve had a wonderful experience and feel privileged to have attended course, it’s amazing what you can learn in such a short space of time i could not fault it one bit even now after a few weeks I am so pleased with this new ability and am using it as much as I can starting to get noticed now in my local gym where I have a room rented might only break even to start but confident it will improve recession or not. once again many thanks. The 5 day Raynor Massage Certificate Course fee varies country to country due to the costs of venue hire, accommodation for teachers and other factors. We do not have any set entry requirements other than being over the age of 16 and having a desire to learn and to heal through massage. For more information please contact us. For our Australian students, as well as qualifying in our Raynor massage you can go on to get Australian government qualified in the Certificate IV in Massage Therapy and the Diploma of Remedial Massage by completing theoretical aspects of that course with Health Schools Australia. Nurses, other health professionals and some other suitably qualified people may be able to get Australian government qualified just by taking our massage course and then getting Recognition of Prior Learning for their other qualifications with our partner school Health Schools Australia. For more information about this please see our video here where the principal of Health Schools Australia discuss government qualifications and how he recognizes our massage courses in Australia. Q: I have never massaged anyone before. Will I really be able to do this after just one week? A: Yes! We have trained thousands of people with no massage experience who have left the course to become successful and highly effective therapists. Q: I have been working in the massage industry for years, will I find the Certificate too easy and should I start straight on the Diploma course? A: No! Raynor Massage is so different from any previous massage you will have done that you will be learning a lot of new things from day one. You need to complete the Certificate Course before you can progress to do the Diploma. Q: I am not 20 and not skinny won’t I feel too embarrassed being undressed for massage? A: First of all we place great emphasis on professional draping. You will be covered by towels at all times while being massaged with only the part of your body being massaged being uncovered. Belly massage is carried out through a towel for privacy. While we have trained people from 16-84, the majority of people on our courses have already had some experience of life so you won’t feel out of place. If you are particularly body conscious or for religious / cultural reasons you cannot undress to underwear for massage, then you can be massaged through loose clothing. Remember you will be draped in towels at all times! Q: Is the course residential? A: Not usually. You will be responsible for your own accommodation, food and travel, we can however offer suggestions for accommodation near to our massage schools. We do offer a residential course at our retreat centre in Hawaii where accommodation is included in the course fees. Q: What do I need to bring on a course? A: You will need to bring comfortable clothing, flat shoes and four large and two small towels. We provide the massage tables for use during the course and all oils. Q: I have never heard of Chi or Meridians. Does that matter? A: No. The course does not assume any prior understanding or knowledge. Q: I don’t really believe in Chi and people’s energy. Can I still do this course? A: Yes, you don’t necessarily need to agree with a particular philosophical point of view to be able to learn Raynor Massage and give an incredibly effective massage. Do try to come to the course with an open mind – many people do go home with a different understanding of the human body and the body-mind interaction and recognise that there is much to learn from these ancient traditions even if their personal belief system does not integrate it. Q: Do I have to do lots of reading and academic study? A: No. We will provide a full course handbook and training DVD and give you suggestions for further reading should you wish to add to the knowledge gained on the course. You do not need to learn the Latin names of muscles and body parts, we believe it is more important to find and eliminate tension in the body than be able to give it its scientific name. Some of our students go on to read further after the course as part of their ongoing development and we will give guidance for this if its wanted, its not essential to you becoming a good Raynor Therapist. Q: Can I get insured from this course? A: We work with a number of insurance companies, in all the countries we train in, who offer insurance for our students. Click here to view the full details. Q: What do people do after the course? A: Some will work full time as a Massage Therapist, others work part time and others massage friends and family. Most who want to work professionally in this field will go on to do the Diploma course either immediately or after gaining more experience of practical massage. A: You can enrol into our courses here. Please see our FAQ for any further questions.